A & W.C. Henderson Automobile Engineers in Rosehearty. Homepage. This page: Neatly illustrated invoice from the 1930s that advertises British India tyres. A telegram sent to "Henderson Rosehearty" in the 1930s would have found its way to A. & W.C. Henderson - Automobile Engineers, of Rosehearty, close to the town of Fraserburgh in Scotland. Alternatively a phone call to telephone number 8 would also have got you in contact with their workshop. 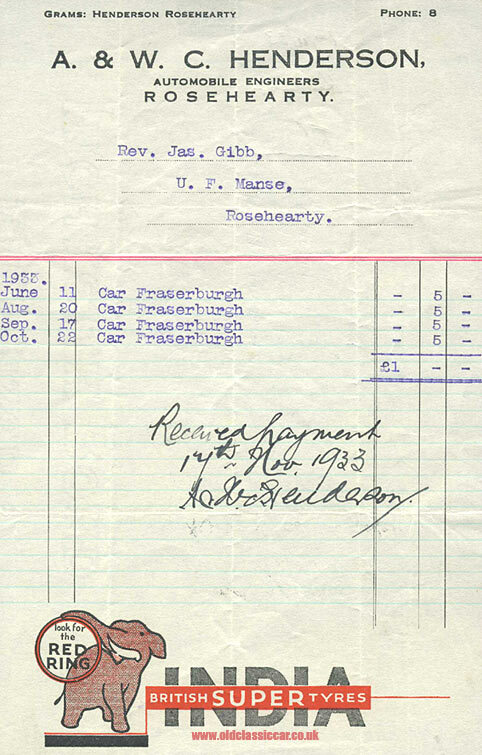 The invoice - totalling £1 - was for four car trips to/from Fraserburgh, undertaken by the Reverend Jas. Gibb of the U.F. (United Free Church) in Manse, Rosehearty. At the foot of the invoice is a smart advertisement for British India tyres - "look for the red ring" - customers were advised to do (an advertising blotter dating to the 1960s for India Tyres can be found on this page of the site). The make and model of motor-car used for the trips to Fraserburgh isn't mentioned unfortunately. Neither is the address from which the two Hendersons ran their automobile repair/hire business from, which is a shame. More items of paperwork relating to garages and motor factors can be found in the Motoring Collectables section.